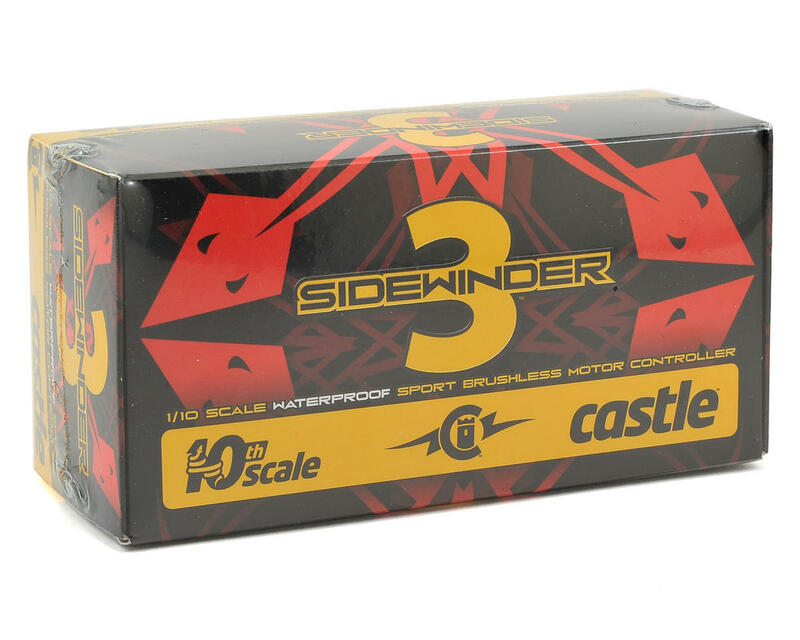 This is the Castle Creations Sidewinder 3 Waterproof 1/10 Sport ESC. Castle’s Sidewinder ESC is now waterproof! The Sidewinder 3 can power crawlers on water filled trails, AWD's in rain soaked parking lots, and SCT's on adventures through muddy fields. Drivers can now give in to those irresistible urges to drive in the mud or rip through puddles without damaging their ESC. The Sidewinder 3 offers world class performance at an entry level price. Although Sidewinder 3 and Castle brushless motors are waterproof, always rinse the ESC and motor with fresh water after exposure to corrosives or dirt. While the motor and controller may be waterproof, Castle suggests users confirm that the rest of their vehicle, including the batteries, servo, radio and chassis, are also waterproof before exposing them to liquids of any kind. 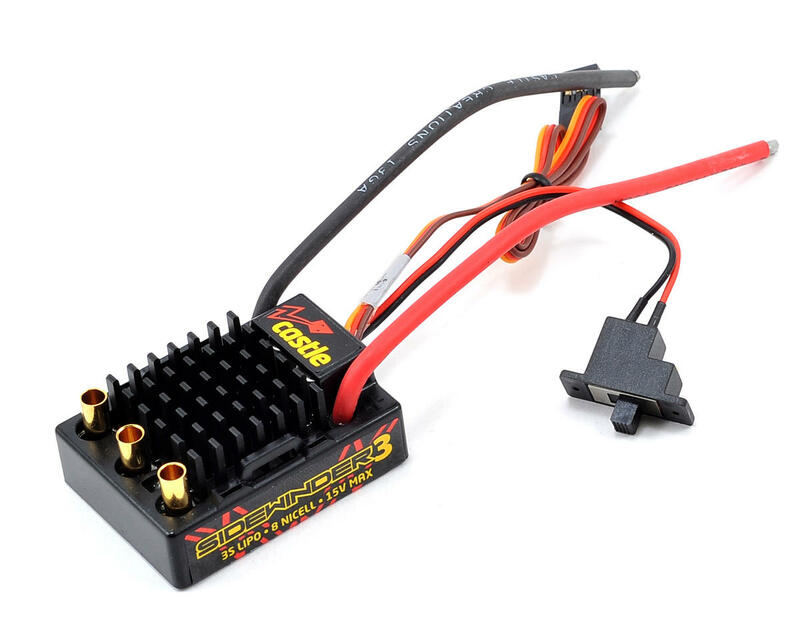 best investment ever, this esc for the price is a bashers dream and i recently had a velenion esc and motor system. the velenion esc's are junk and always have problems 2 of my have either fried or the button broke. even i go to the track every now and then and it preforms greatly. Very happy with my Sidewinder 3. I like the 4mm motor plugs - allowed me to use short motor wires for a clean installation. Love Castle Link. Created an expo throttle curve, custom drag brake and slightly reduced punch (torque) because I race on a medium traction track. It allows you to print the settings so you don't forget what you've changed and can use as a reference for future fine tuning. I ran 20 laps with a 3800kv motor on 2 cells and the ESC was only at 120 degrees. (on a 92 degree day with the track surface at 135 degrees). AND.......... Castle has a great warranty program. After your ESC is out of warranty, they offer discounted replacement as an out of warranty repair. GREAT CUSTOMER SERVICE. I tend to be a critical consumer but I have to say, Castle Creations makes a great product, offers great customer service, has a great warranty and gives big discounts for out of warranty replacement. Ok product. It only lasted about 5 or 6 runs before it suddenly stopped turning on. No beep, nothing and this is the second castle ESC to do this. After flipping the off/on switch repeatedly it will eventually turn on. another problem I have is now there is at least a 3 second delay between going into reverse from forward. Update: 1 Year later it still is running. It does some of the things mentioned above occasionally. it's been in my Telluride and I've beaten the crap out of that vehicle and the esc still works. So i'm changing from 3 to 4 stars. Experience with this has been horrible. First off the connections for the motor leads are top mount not side mount which means that you cannot put the body on your buggy if you mount the ESC on the ESC platform as it will be too tall. Secondly the receiver connection was so tight that I could not unplug it to use the castle link (one of the primary reasons I chose this ESC in the first place). Even with everything else unplugged I could not pull it out (old ESC does not have this problem). Eventually the plastic casing around the connector brok before the connectors would unclench. So Before it was ever even used it is broken. I am so irritated that I wasted my money on this product.